While the season has been a bit lackluster, it seems to have picked up steam in the final quarter. 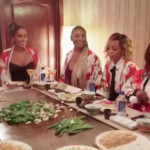 Nene Leakes, Kandi Burruss, Cynthia Bailey, Porsha Williams, Shamari Devoe, Eva Marcille all hit the sofa to battle it out and you will NEVER believe who was the target of just about all of the ladies. It was THOT princess vs. the OG queen as Nene sat at the helm of the reunion show this year, flanked by Cynthia, Kandi, Eva and Shamari. 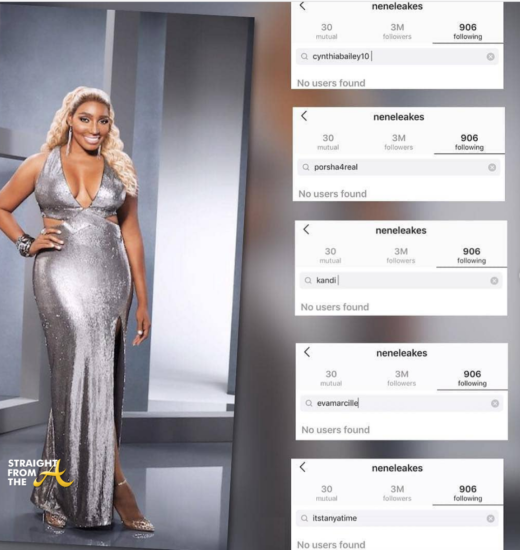 Social media has been ablaze today as Nene Leakes unceremoniously UNFOLLOWED most of her cast mates on social media. My sources reveal that Leakes feels betrayed by several of the cast members who came gunning for her during the reunion. Hence her IG post proclaiming that she’s the OG ‘THREAT’! Porsha Williams, who has reportedly landed a short spin-off for her the arrival of baby PJ, faced off with Nene Leakes over last week’s closetgate. 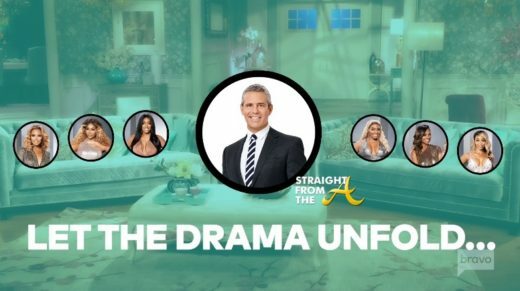 Porsha and Nene have always had a somewhat close relationship but apparently Porsha feels that Nene overreacted during ‘closetgate.’ Rumor has it that in a future episode, Williams tries to claim that Nene was out of control and way too aggressive. Being that Nene was one of the few who stood up for Porsha when she dragged Kenya across the stage, Leakes felt her accusations were unjustified. Eva Marcille is said to come gunning for the queen as she gets pissed off over reports that Nene was spreading rumors about her financial instability. 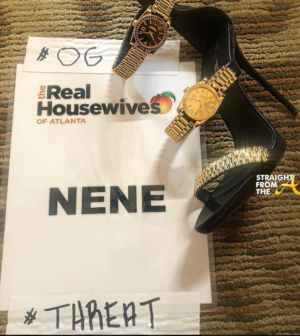 Eva even shared her newfound attitude on social media, stating that fans of RHOA underestimated her. Word on the curb, is that Nene had absolutely NOTHING to do with the rumors. In fact, it was one of Eva’s own bridesmaids who has been spreading details about the ANTM alum’s financial and housing situation (story coming soon). Coincidentally, Nene is the reason Eva got a peach in the first place as she arrived to the show as “Nene’s friend”. I have to admit, I side-eyed all of Eva’s ‘big sis’ commentary (as did most of the housewives) and it seems that Eva may have latched on for a come up. But I digress. The most devastating part of the reunion was apparently the break-up of a 9 year friendship. If you’ve been paying attention, I’ve been trying to clue you in on the brewing tensions between Nene & Cynthia Bailey. Nene’s been shading Cynthia for about 2 years now, but apparently something finally happened that sealed the deal. I would think that it was Bailey partnering with Kandi to bring Kenya back on board… but what do I know. 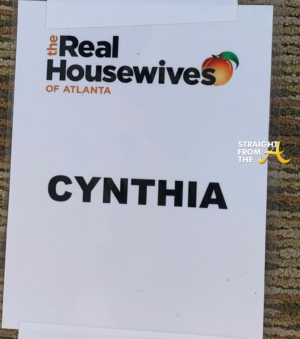 Nevertheless, Cynthia and Nene’s friendship contract might finally be dead and buried after the reunion. 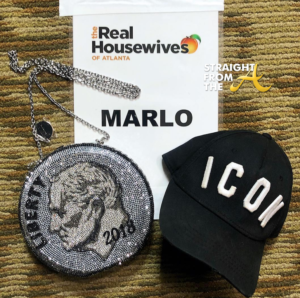 Marlo Hampton deserves a peach…PERIOD. Marlo was instrumental in quite a few story lines this season. When Marlo came out during the reunion, she was posted next to Nene, where she battled it out beside her ‘bestie’. Tanya Sam is now Eva’s new bestie. Tanya reportedly feels ‘somekindaway’ about Nene’s change of heart regarding their friendship (as you know, Nene was instrumental in landing Tanya a friend spot). 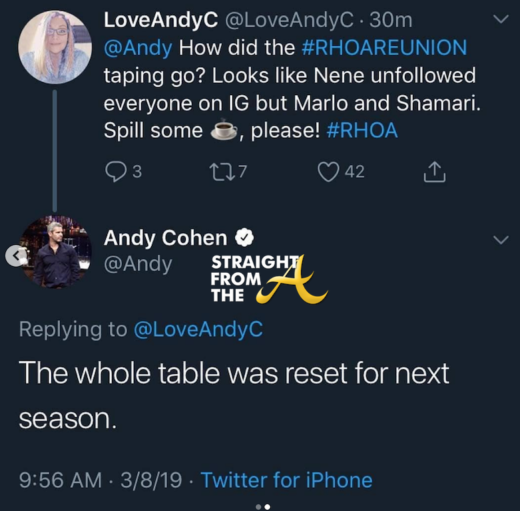 Tanya addressed Nene about it during the reunion and rumor has it she also felt somekindaway about not being invited to Andy’s baby shower. Shamari Devoe has a peach… but my source says you couldn’t tell by the way she was acting. Shamari had little to no input during the reunion AT ALL and sat quiet as a church mouse. What are your thoughts about this season 11 reunion tea?